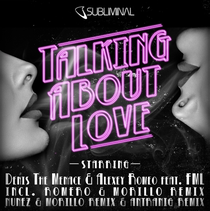 After the success of 'World In Your Hands', Denis The Menace collaborates with one of Russia's top producers, namely, Alexey Romeo, to deliver 'Talking About Love', what they hope will be one of the records of the summer season. The original mix by Denis The Menace & Alexey Romeo provides a powerful progressive beat combined with the emotionally heartfelt vocals by FML. Just as effective as the original, Subliminal's head man Erick Morillo, and Harry Romero, Jose Nunez and Antranig deliver three uniquely different remixes, geared towards the late night, after-hours. All four mixes are extremely playable, all geared towards the clubbing environment. It’s been out since last month, check out the recently released official video below.